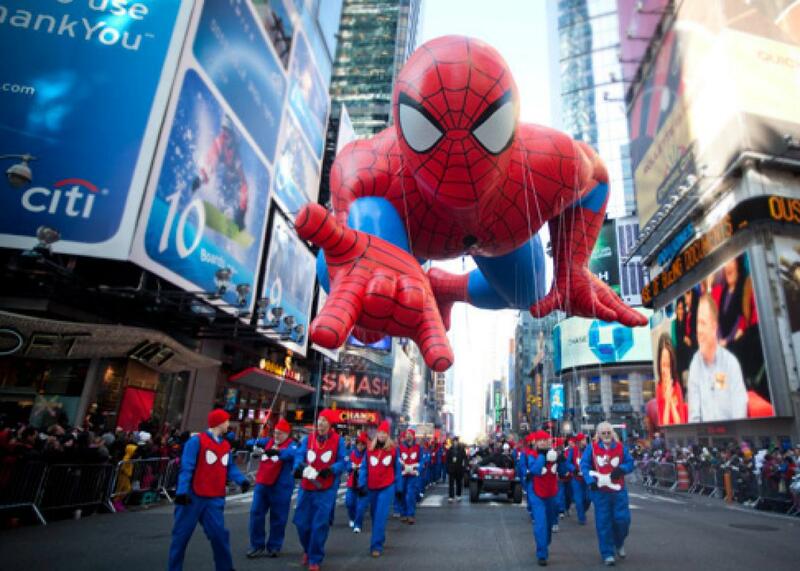 Macy’s Thanskgiving Day Parade 2012: Helium is wasted in floating parade balloons. Should be wasting our dwindling supply of helium on floating cartoon characters? For Americans, the fourth Thursday in November can mean lots of things, usually some combination of food, family, and football. But before all that, there’s the Macy’s Thanksgiving Day Parade. The three-hour, 80-plus-year tradition starts at 9 a.m. and boasts 16 gigantic balloons. If you are ambitious and want to brave the cold on the night before, you can watch those balloons get inflated. In addition to seeing Kermit the Frog or Spider-Man, you’ll also witness the squandering of the global supply of helium. At projected rates of consumption, all the currently available helium on Earth will be depleted in about 40 years. While its best-known use may be filling balloons and making people who inhale it squeak like Mickey Mouse, the element’s scientific uses are arguably more valuable. No other gas is as light without being combustible. Those properties, as well as its very low boiling point and high thermal conductivity, make it indispensable for aerospace engineering, deep-sea diving, and cryogenics. So, while a world with no more balloons is a sad specter, without liquefied helium we wouldn’t be able to make superconducting magnets like those in MRIs. The sorry state of our helium reserves can be traced to three key factors. Thanks to a 1996 act of Congress, the price of helium is artificially low, so there’s little deterrence for overuse. There’s also the fact that we have no idea how to artificially produce helium in any real, sustainable way. Finally, helium’s unique properties make finding a viable substitute almost impossible. The helium we use today is found in underground gas pockets, often associated with natural gas. Helium is abundant in the universe, but here on Earth it is more elusive; while there’s a lot of helium in the atmosphere, it is very difficult to purify. It’s really only when it is trapped underground that we can isolate it. This helium is largely formed as a by-product of decaying radioactive elements. The rate at which it is produced accounts for less than one-half of global demand, and most of it cannot be recovered efficiently. Producing helium artificially is possible in theory, but only through fission or nuclear fusion of two hydrogen atoms. Fission is impractical because enormous quantities of heavy metals like uranium and thorium would be necessary, and fusion won’t work because of the high energies required to combine hydrogen atoms to form helium. Commercial fusion energy is the goal of much research around the globe but is very far from being a reality. (The New York Times recently questioned the DOE’s investment in fusion research.) Even if fusion ever reliably produced more energy than is required to start the reaction, the industry would not take off for many decades, and the amount of helium produced would be marginal. While helium can be replaced for some applications, in cryogenics there aren’t any alternatives. As a result, nearly 6.4 billion cubic feet of helium are consumed globally per year out of a slowly dwindling supply of 1.87 trillion cubic feet. If the rate of helium consumption grows at 4 percent per year (as the National Academy of Sciences projects) the helium currently available, plus that estimated to be untapped underground, could all be lost to the atmosphere in 65 years. Once helium is released into the atmosphere—as when balloons are deflated—it becomes almost prohibitively expensive to retrieve and purify. The lower the helium content a gas has, the more expensive it is to separate out. No one knows exactly how much it would cost to purify it from the air, but Nobel Prize-winning Cornell physicist Robert Richardson (co-chair of the 2010 NAS report) estimates it may make the price of helium 10,000 times what it is now. Of course, there are those that think the helium panic is overblown. Some estimates claim the global supply of helium will last at least another 300 years. As helium becomes more scarce and expensive to purify, recycling will become more widespread, but recycling is possible for only certain applications. The source of the helium we use now was discovered in 1903 in Dexter, Kan., when drillers happened upon gas that didn’t burn. They were disappointed, but chemists eventually studied the gas and realized that natural gas deposits in the United States often contain helium in single-digit percentages. As it turned out, the Great Plains was hiding enormous amounts of helium, and the United States quickly became, and remains today, the world’s biggest supplier of helium. Many uses were found for the gas—in particular, lighter-than-air travel. In 1925, the United States created the National Helium Reserve to ensure our dominance in the zeppelin wars that were sure to come. (The Hindenburg was filled with the very flammable hydrogen rather than helium because the United States controlled helium supplies and was loath to provide the gas to Germany.) In 1960, demand for helium increased, so Congress created incentives for natural gas producers to sell their helium to the helium reserve. This helium has been stored by the Bureau of Land Management in giant underground caverns in the Texas panhandle to this day. By 1996, the BLM had a large amount of helium, but the agency was also $1.6 billion in debt. To offset that debt, the Helium Privatization Act was passed to sell the government’s reserve to private companies. Unlike the strategic petroleum reserve that is maintained for emergencies, the helium reserve was seen as a financial burden. The solution was to sell it off as fast as possible. The price was determined by dividing the existing debt by the remaining volume of helium. It wasn’t chosen by assessing supply and demand, but was based on recouping the cost of running the BLM facility. This is analogous to digging up gold in your backyard then selling it at a price sufficient to pay for the shovel you used. Since the United States is the biggest supplier of helium globally, the market value for helium has been artificially lowered. While some other countries (Canada, Russia, and Algeria) produce helium, they collectively supply only 22 percent of global demand. When the act was first passed, the price set was close to double the market price. The stock was not depleted, and in fact, a 2000 report by the NAS concluded that everything was going fine and that the price the BLM was asking was still above market value, writing, “Based on the information assembled for this report, the committee believes that the Helium Privatization Act of 1996 will not have a substantial impact on helium users,” in part because “[s]ince the mid-1980s, there have been no drastic increases in the price of helium and no shortages of supply.” But then global demand increased and the price tripled by 2008. U.S. consumption actually decreased, but that was more than offset by increased use abroad—primarily in Asia for semiconductor and fiberoptics industries. The market bought just about every cubic foot of helium the reserve would ship, and more than half of the reserve has been depleted. In 2010, the NAS issued a new report that detailed the slow-moving disaster, concluding that the law “could amount to a taxpayer-financed subsidy for consumption of this scarce publicly owned resource.” The reserve was being tapped too quickly, supplying one-third of world demand. Worse, since the price of helium from the reserve is so low, companies are discouraged from purifying helium because they can’t get a fair price for it. Natural gas companies have little incentive to invest in the equipment and energy necessary to purify it, especially when the helium concentration is low—so the helium is being lost to the atmosphere. What we should be worried about now is what will happen when the BLM helium runs out. The 1996 act has addicted the global markets to artificially low prices. As the BLM raises its prices, global prices follow. Earlier this year, scientists and industry experts testified before Congress about the problems with the Helium Privatization Act, arguing in favor of new legislation. They proposed the Helium Stewardship Act, which would grant the BLM more freedom in selling its reserves. But the new proposal still mandates selling off most of the reserve, and would cause much of it to still be sold at artificially low prices. So enjoy Spider-Man flying down Sixth Avenue, or the Elf on the Shelf bouncing down Central Park West quietly judging you and your children. Remember them years from now, as the helium supply diminishes and demand continues to grow, raising prices and leaving us with defunct MRI machines and deflated balloons.